Many that come to visit in Ucluelet BC only stay for a short time, but end up wishing they had a week or more to take everything in. While Ucluelet is a place to relax, recharge and take it easy, you may find yourself packing days in order to see and do it all. Everyone is different when it comes to a perfect day, but here’s an itinerary for one that looks pretty ideal! Good morning Ukee! Life in Ucluelet often starts out at the crack of dawn, especially for surfers. Fuel up with a quick coffee and a banana or muffin, then head out for a surf check! Depending on the wind and waves, you can luck out and score some waves at Wickaninnish Beach, the closest to Ucluelet, or you could be heading towards Tofino. Luckily, there are numerous beaches to check, and each prefers different conditions. If you’re not into surfing, an early morning beach walk before the crowds, kayaking in the still harbour, embarking on a salmon fishing, or whale watching charter also make for great “crack of dawn” activities. Depending on how long your morning activities have taken, you’re likely to have worked up both a sweat and an appetite. Places like the Blue Room and the Matterson House, or Zoe’s Bakery, are the perfect pit stop to indulge in a well-earned breakfast or lunch. Baked goods, coffee and belly-bursting meals are on the menu, and it will help get you ready for the rest of your day. To enjoy even more outdoors, take your breaky/lunch to go and sit down overlooking the Ucluelet Harbour. Big Beach is just down near Blackrock, and the picnic benches and driftwood there are also inviting to take a seat and enjoy. After lunch, pop into the Ucluelet Aquarium! It’s the perfect place to get a feel for the wildlife in the area, and to learn how to do your absolute best to take care of it while in the area. Under the Pacific Ocean is an abundance of incredible animals, and the catch-and-release, seasonal aquarium is the best place to see them alive and up close unless you’re a cold-water diver. Now is the time to get that relaxing and recharging in. Kick back with a glass of wine, or a beer on your patio, or by the ocean and just soak it all in. Solidarity Snacks, some oysters from the Raven Lady, or even more baked goods from Zoe’s are always a great accompaniment. Speaking of relaxing, the Drift Spa at Blackrock Resort, or Nurture Day Spa over at Water’s Edge offer plenty of treatments that will put the essence of the ocean and forests right back into your skin and rejuvenate you for your stay. Blackrock even has hot tubs and pools that sit on the edge of their perch over the ocean! Ucluelet also has a number of great little shops to pick up gifts and souvenirs of your time. The Den Studios, Gypsy Drifter, Rubio, Relic Surf Shop and Long Beach Surf Shop are some great stops for goods crafted by local artists, or local branded clothing to remind you of your time on the coast. All the outdoors and fun will likely have you more than ready for dinner, so it’s time to get that show on the road. Ucluelet has a number of great restaurants that are worth a try, depending on what you feel like. If you’re a foodie or want to splurge on some fine dining that features west coast fare with an international twist, check out Norwoods. It’s one of Ucluelet and Vancouver Island’s top rated restaurants. While pricy, the portions are great and the food is absolute, tasty perfection. Doing the wine pairings with each dish is highly recommended. Another great option is Abbondanza Pizza. This one you can take to go and head on over to the beach for a sunset dinner and a show. Incredible flavours, fine ingredients and a tasty, thin-crust sourdough make for the perfect pizza. It’s a hidden treasure on Vancouver Island, and a local go-to. If you’re ordering on a weekend, be sure to call well in advance, as these handcrafted beauties are in high demand and perfection does take time. Beach bonfires are the perfect way to end a long, full day in Ucluelet. After the sun has set, get the fire going and enjoy the warmth and relaxing crackling as the stars start to shine overhead. If you’re looking to continue the day’s fun, head over to Howler’s for the arcade, beers and bowling, or on to Officials or the Eagle’s Nest. Karaoke and Jam Night are always a good time. Of course, everyone has their image of an ideal itinerary. Maybe you just want to stretch out on the beach from dawn to dusk and absorb some sun, or strive to hike every single trail. Perhaps room service, hot tubs and spas are more your pace. 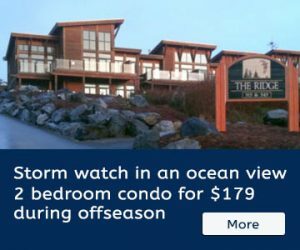 Ucluelet has a way to create the perfect stay, no matter what you desire from a holiday. Check out more blog posts for ideas, or our accommodation page for places to stay!